BBQ from a roadside stand. Nothing gets me more excited. When I was running a few errands this morning, I noticed a tent going up in the parking lot in front of Big Lots on Kilgore Road near Westnedge. I did a quick U-Turn and doubled back through the parking lot to see what it was. I could see the big grill, so I knew it had to be something good. 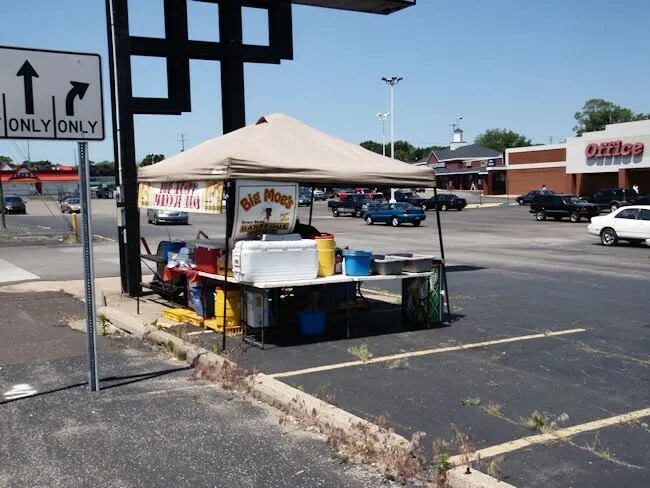 Big Moe’s BBQ set up shop in the parking lot with a grill, some warming pans and a couple coolers. 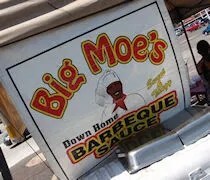 I’ve heard good things about Big Moe’s sauce and always wished they had a restaurant somewhere in Kalamazoo. Since they don’t, I haven’t been able to try the sauce everyone raves about. When J got home from work, we decided to walk to Big Lots and get some BBQ. Well, I decided. I don’t think she was in the mood for it, but she went along anyway. They have a pretty simple menu at this roadside stand. Ribs, rib tips, sausage, pulled pork and BBQ chicken. J was thinking about the BBQ chicken, but we both ended up with the pulled pork like we always do. For $5, you get a sandwich and a side. I took a bag of chips. 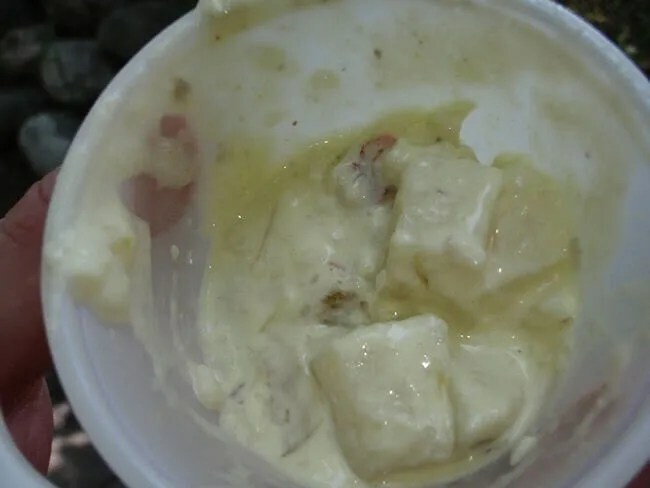 J got the potato salad. There’s nowhere to eat around the tent, so we started walking home. I didn’t want to wait. We grabbed a couple forks and I ate straight out of the small Styrofoam container while walking. I have a feeling the sauce on the pulled pork is not the sauce they’re famous for. The meat was nice and tender, but it was drowning in a thin tomato based Carolina style sauce. There wasn’t even much a vinegar kick to it. The only flavor that came out was a slight tomato-y flavor, but even that wasn’t too strong. I thought it was ok. J didn’t like it at all. There wasn’t a whole lot of flavor to it. I’m really not a fan of pork that is sitting in a pan of sauce before it’s put on the bun. 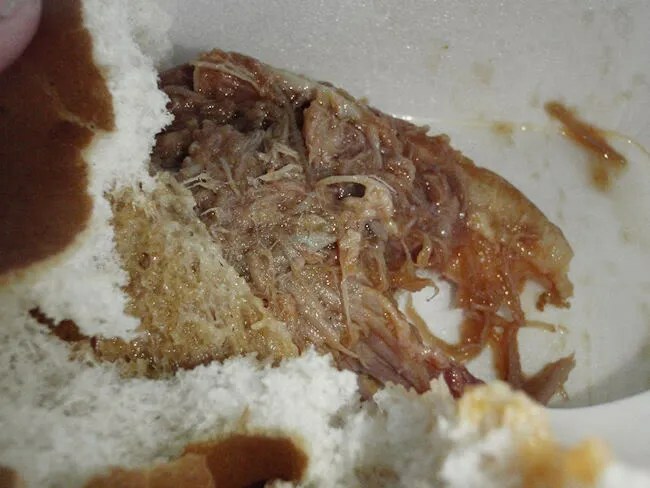 When it comes to pulled pork, I’d rather to pork be served naked, but if it is served with a sauce, I prefer that sauce be put on after it’s put on the bun. Soaking the meat tends to pull out any of the smoke flavor. I know the smoke is there because we could smell it from half a block away. It just didn’t come through with the meat. When the grill was opened to get the meat, we could see the ribs and that had a much thicker sauce on it. We’re both fans of a Memphis style sweet sauce. I have a feeling we’d have a much different opinion if the sauce that was on the chicken been put on the pork. Again, that’s why I’m a fan of pulled pork being served sauce-less. Big Moe’s was a little disappointing today. I wanted to like it. I still want to like it. It’s just not the style of pulled pork that I prefer. That doesn’t mean you won’t like it. There’s a market for pulled pork done this way or Moe’s wouldn’t be successful. I want to go back and maybe pick up some of the ribs now because I’d really like to give this sauce I keep hearing about a shot, but you know how first impressions are. I may go back on my own, but I don’t think I’ll be able to convince J to go back with me. I have a few roadside bbq stands in my town. I stopped to one the other day and it was the best bbq i have ever had. I have seen some of these roadside businesses do so well that they opened a restaurant that was very successful. You have to start somewhere whether its roadside or not. We sent a contract to you, to come and be apart of our Fair in July. You have not responded. We would like to hear from you. The contract was sent to Ranell Murphy. I am opening a business at 3500 east main(EASTWOOD PLAZA) and would like to talk to someone about this business opportunity. I am taking the unit on the end , unit 3420, the old bank on the west end of the strip mall. I have control of the space next to my unit and would like to talk to you about setting up you BBQ business next to mine. This is a great spot for a BBQ setup and I think it will benefit us both. Please call me asap if your interested, we will be opening in 2 to 3 weeks. Would like this setup to be open 7 days a week to service the community and my patrons.